Somnath Temple or Somnath Jyotirlinga Temple is situated in the Prabhas Kshetra near Veraval in Saurashtra, on the shores of the Arabian Sea, on the western coast of Gujarat in India. The temple is dedicated to Someshwara, another name of Lord Shiva, with moon on his head and is first among the twelve Jyotirlinga Temples in India. Built at the shore of the Arabian ocean on the western corner, Somnath Shiva Temple is a well-known pilgrimage center in India. This Jyotirlinga shrine dedicated to Lord Shiva is also known by other names such as Deo Pattan, Prabhas Pattan, or Somnath Pattan. Somnath literally means “The Protector of Moon God”. Someshwar Mahadev Temple is believed to have built out of gold originally by Somraj, the Moon God himself, then rebuilt by Ravana in silver, then by Lord Krishna in Wood, and then by Bhima (the strongest of the five Pandava brothers) in stone. The present Somnath temple is the seventh one reconstructed beyond six repeated destruction by the Muslim invaders. Though built in the Kailas Mahameru Prasad style, the Somnath Temple’s architecture influences that of Jain style. The temple consists of Garbhagruh, Sabhamandap and Nrityamandap with 150 feet high Shikhar and a Kalash at its top. The dome of the temple is the biggest one. The Somanath temple faces east and has a vast central hall with three entrances, each protected by a tall porch. Added attractions are the carved doorways, the sculptured representations of Nandi (the celestial bull) and the figures of goddesses. In the balconied corridor is the damaged form of Nataraja statue. Shri Kapardi Vinayak and Shri Hanuman Temple are other spots to be noted in the temple. This temple is said to be the place where Lord Krishna performed all his Lilas. There is a small cave in the temple where a lamp burns continuously. According to myths, moon was married to the 27 daughters of Daksha Prajapati. But he was preferential to Rohini and ignored other queens. The angry Daksha cursed Moon that he would lose his beauty and brightness. Eventually, moon came down to Prabhasa with Rohini and worshipped the Sparsa Linga of Somnath. Subsequently, he was blessed by Lord Shiva to grow and shine in the bright half. It was Lord Brahma who installed the Brahmashila and paved way for the construction of the temple. Somnath Temple is open for darshan from 6:00 am to 9:00 pm. Aartis are conducted three times a day. First Aarti at 7.00 am second one at 12.00 Noon and third one at 7.00 pm. Somnath Mahadev Fair - This fair is celebrated in November, to mark the birth of Kartikeya (Lord Muruga), son of Lord Shiva. Also known as Kartik Purmima Mela, the fair features stage shows, folk dances and instrumental music in the Somnath Temple. Maha Shivaratri - Shivratri Festival at Somanath Temple is another major festival celebrated here in the month of February – March every year. 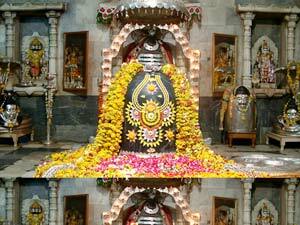 Thousands of Hindu devotees visit this Jyotirlinga shrine during Shivaratri Festival. A sound and light show called “Jay Somnath” is displayed in the temple every night during 8.00 to 9.00. There is a beach outside the temple where visitors can enjoy the beautiful sunset point, Vallabhghat. This holy Bhalkha Teerth is located 5 km on Prabhas Veraval highway. It is said to be the place where Lord Krishna was struck by an arrow of a tribal. Also known as Shri Krishna Neejdham Prasthan Tirth, Dehotsarg Teerth is located on the banks of Hiran, about 1.5 km from Somnath Temple. Other nearby tourist places near Somnath include Veraval Beach (5 km), Gita Mandir (1 km), Somnath Museum, Junagadh Gate, Ahalyeshwar Mahadev Temple built by Queen Ahalyabai, Lakshmi Narayan temple, Balramjiki Gufa, Mahaprabhuji's Bethak, Triveni Sangam, Shree Parashuram Temple, Sun Temple, Prachi and Shashibhushan temples, Shree Veneshwar Mahadev Temple, Chorwad Beach (26 km), and Gir National Park (43 km). 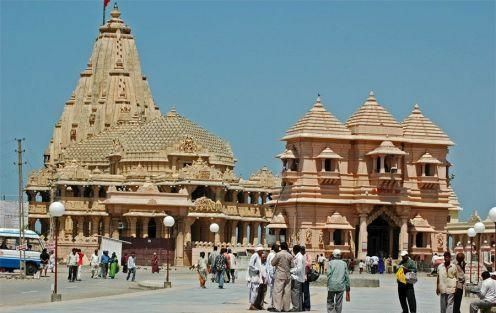 Somnath is well connected by road to nearby places such as Veraval (7 km), Junagarh (85 km), Porbandar (122 km), Bhavnagar (266 km), Ahmedabad (465 km), and Mumbai (889 km). Veraval Railway Station is the nearest railhead, 7 km from Somnath. It is connected to Ahmedabad and some other cities in Gujarat. Veraval Railway Station Code is VRL. The nearest airport is 55 km away at Keshod, which is linked to Mumbai. Regular buses and taxis are available between Keshod and Somnath. The nearest international airport is Sardar Vallabhbhai Patel International Airport at Ahmedabad.